Could a small group of subject matter experts, instructional designers, rich media experts and coders build a complete course in five days? This approach is gaining experience for the writing of books, why not courses. The approach would fit very well with the Agile Instructional Design approach and would take the best from the unconference, the book sprint and the scrum sprint. 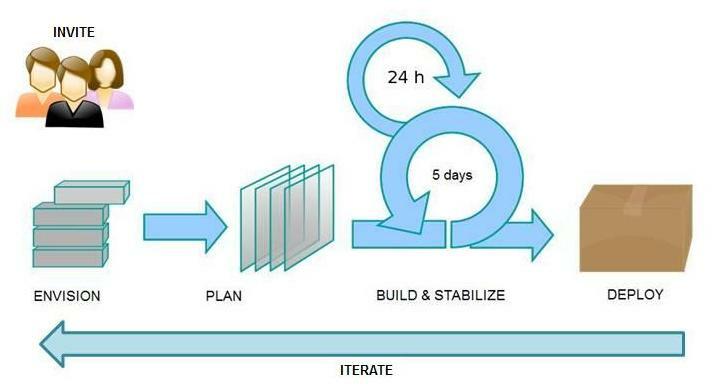 This is how I would envision the AID Sprint; I believe a sprint will occur within 5 to 10 working days. Finding the right group is about composing the right invitation. Be sure to be as specific as you can about the subject of the AID sprint. But leave it loose enough to encourage participation. The real focus will come out of the envision step. All the participants need to agree to meet in the same space for the duration of the sprint. Use brainstorming techniques, such as how stickies are used in an unconference. The point is to quickly create a shared vision of the module, course or curriculum - whichever fits best within the time available for the sprint. Start building the content. By this time the smaller focused groups would have formed to create individual items of content. It may be a good idea to have groups form around content types so they can focus and create all the identified pieces. The idea being, have one group focus on video resources, another on graphics, another on the text and organization, another on assessment. Once content starts to come together the sprint team should start to coalesce what they can. The iteration here will assist greatly in team energy and identifying what needs to be built and improved upon. This is where everything has to come together and the user testing begins. The unified build brings together all the individual content pieces and the course flow comes together with the assessment approaches. The stabilization also includes the technology stabilization and the first round of deployment to the production environment. Pushing work out to the web should occur as soon as a module is ready. Iteratively, pushing working modules out to your production internet environment creates success and attracts learners / testers / users. This is the only place you get real feedback, when you are live and on the internet. This feedback puts you on the road to continuous improvement. Go back to the envision and planning steps, iterate and build more modules. Learn from the build, stabilize and deploy steps just completed and add further learning modules. Work towards completion of complete curriculum. To build a learning module focused on Agile Instructional Design with me occupying all roles. This will allow me to work out the bugs in the sprint methodology and to learn the technology for implementation. Send out an invite toward one of the curriculum areas I have identified in legal education for the adult public. Like this model a lot! 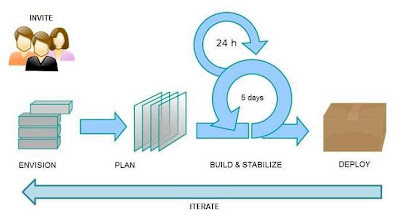 We've been having lots of discussion around how to apply Agile methodology to developing learning content and I think this pulls the ideas together really nicely. Thanks! Yes! This is great stuff. So glad I stumbled onto your blog and site, Peter. I'm preparing some info on AID for some presentations - would love to include some of the ideas from your work here (with links and citations to you, of course!) Can you let me know if that is ok and how you'd like attribution? thanks! Clark, feel free to use my stuff in any way you want... if you make a few bucks off my work, please make a donation to an adoption agency. Attribution is nice, just my name and a link to my blog would be good. Thanks for the encouragement! Thanks, Peter. Also realized I should have been more specific as I didn't leave any contact info, etc. I'm Sr. Instructional Designer with Johns Hopkins Bloomberg School of Public Health's Center for Teaching and Learning in Baltimore, MD - and have been preparing presentations for higher ed. conferences, primarily stateside - such as SUNY's CIT conference, a UMassOnline speaker series, and the Sloan Consortium's ALN conference on agile ID teams. So I don't anticipate making any bucks - but do anticipate sharing, collaborating, and growing interest in the area of agile instructional design whereever I can assist spreading the seeds. :) Once I have the presentation ready, in the next few weeks, I'll share the results with you as well.